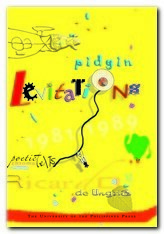 Ricardo M. de Ungria - Ricardo M. de Ungria earned his A.B. Literature from the De La Salle University, and later obtained an M.F.A. in the Creative Arts from the Washington University in Missouri, U.S.A in 1990. He is a founding member of the Philippine Literary Arts Council (PLAC) and the Unyon ng mga Manunulat ng Pilipinas (UMPIL). For his poetry, he has received recognition from all over the world. Not only has he been a Fellow at Fulbright, Hawthornden Castle International Retreat for Writers, Bellagio Study & Conference Center, and Washington University, but he has also gathered awards like the Academy of American Poets Prize. Similar achievements include nods from the Saint Louis Poetry Annual Contest, Florida State University's State Street Poetry Contest, Manila Critics' Circle, Palanca, CCP Verse-Writing Contest, and the Free Press.He has six books of poetry, including R+A+D+I+O (1986), Decimal Places (1991), and the most recent, Pidgin Levitations (UP Press, 2004), a luxurious, refreshingly unabashed collection of the poet's earlier work. He has also edited a number of anthologies, three of which are Passionate Patience: Ten Filipino Poets on the Writing of Their Poems (1995), Catfish Surviving in Little Schools (1996) and The Likhaan Anthology of Poetry and Fiction (1996). Ricardo de Ungria used to hold positions as an associate of the U.P. Institute of Creative Writing, Chancellor of the U.P. Mindanao, and Head of the Committee on Literary Arts under the National Commission for Culture and the Arts (NCCA).